that when plastic is damaged, cracked, broken,or missing pieces, it's garbage. This couldn't be further from the truth. More than ever people now know that glues and epoxies don't really work and are a temporary solution at best. In todays society it is especially important that we take a conscious look at our surroundings and realize just how important recycling really is. Plastic Welding and Repair enables us to do just that. By having our broken items mended or repaired not only are we saving money, we are helping to clean our environment. The only guaranteed fix is plastic welding. 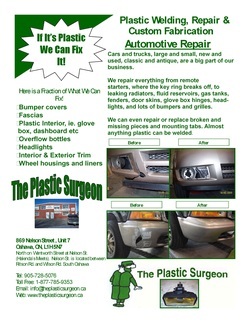 This is where The Plastic Surgeon, Plastic Welding Repair & Fabrication specializes. Virtually anything plastic can be welded back together, usually as good as new as new if not stronger, and at a fraction of replacement costs. We repair everything, new and old, and can fabricate or custom modify almost anything. How long have we been working with plastics? We have been doing this for over 10 years now and are actually getting pretty good at it. Still not sure if we can help? Just ask around, then call us at: 905-728-5076 or 877-785-9353. We are located at 869 Nelson St. #7, in Oshawa. .